On October 22, 2007, TanzaniteOne, the world leader in tanzanite mining, announced the acquisition of a tsavorite project through its subsidiary, TsavoriteOne Mining Ltd. The move was not surprising to people familiar with these gems given that tanzanite is a gem geologically linked with tsavorite. More recently, in September 2008, the TsavoriteOne project was again in the news when Gemfields, a group involved in emerald mining in Zambia, made a surprise offer for TanzaniteOne. This article presents an update on tsavorite, along with studying its potential as one of the coming century's major gemstones. 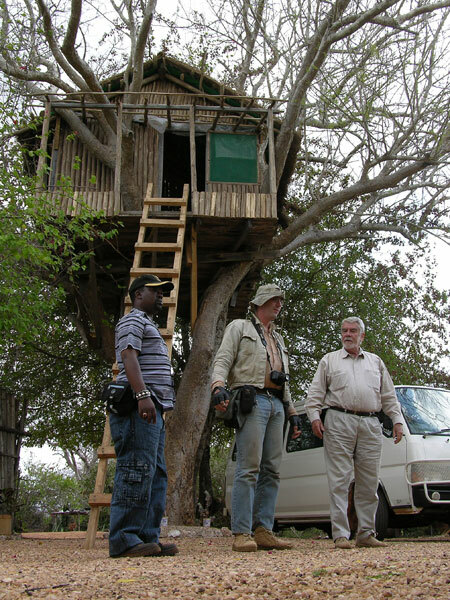 Left to right: Kennedy Khamwathi, Vincent Pardieu and Campbell Bridges, near Bridges' tree-top house in the Tsavo area. Photo: J.B. Senoble, 2005. 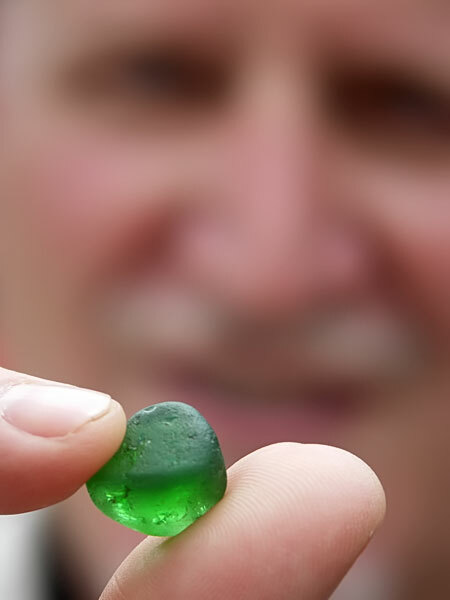 The history of this green variety of grossular garnet is closely tied to Scottish geologist Campbell Bridges who has been involved with the gem since its discovery. Bridges first found the green gem in 1967 while prospecting near Komolo village in northeastern Tanzania's Lelatema Hills. Shortly after this, Tanzania's government embraced socialism with the result that commercial mining became impossible. Bridges was not one to give up easily; he continued prospecting areas with similar geology and his perseverance eventually was rewarded when he discovered a second deposit across the border in Kenya, near Tsavo National Park. The Kenyan government's more amenable attitude toward capitalism allowed Bridges to be off and running (Bridges, 2007). Bridges was just the sort of iconoclast for the job of popularizing the new gem. Living in a treehouse (to avoid lions) and using a python to guard the gems (locals feared snakes) were just two examples of his resourcefulness. He was not alone in his quest for this verdant green gem. Soon he was followed by other prospectors like Peter Morgan (from South Africa) and his Kenyan partner W. Kimani, who in 1973 discovered yet another deposit at Lualenyi, just a few kilometers north of Bridges' claim (Keller, 1992). A gem rush soon ensued and the nearby town of Voi quickly transformed into an active gem-trading center (Khamwathi, pers. comm.). As production ramped up, the time was right for this glittering green gem to enter the world stage. In 1974, New York's famous Tiffany & Co. introduced the green grossular to the US market as tsavorite, a name carefully chosen to evoke visions of the famous Tsavo National Park. Though it is still not accepted by the International Mineralogical Association (IMA) as a variety name, the gem trade has wholeheartedly adopted this inspiring name. Tsavo is also famous for its man-eating lions, and has inspired such movies as Bwana Devil (1952) and The Ghost and the Darkness (1996). The idea to associate the green stone with the name of one of Africa's largest national wildlife parks turned out to be a prescient move. Today tsavorite remains one of the last truly "wild" gems, one for which no treatments or synthetics are known to exist. Wangui Gladwell, the daughter of the Baraka mine owner in Kenya, proudly displays a tsavorite porphyroblast. Photo: V. Pardieu/Gübelin Gem Lab, 2007. The names tsavorite (USA) or tsavolite (Europe), while not accepted by the IMA, are common names used in the trade and in this article refer to a green vanadium rich grossular garnet. The properties of tsavorite have been previously extensively studied and are summarized in the following chart (Switzer, 1974; Gübelin and Weibel, 1975; Amthauer, 1975; Schmetzer, 1979; Bank et al., 1979; Manson and Stockton, 1982). As a singly refractive gem, tsavorite does not suffer any restrictions due to pleochroism when orienting the rough. Therefore, the cutter is able to retain a greater yield, a distinct advantage over doubly refractive stones in which orientation dictates the best color, sometimes entailing considerable loss of weight. If the definition of a gem is a stone that combines beauty, durability and rarity, tsavorite is near perfect. Let's take a closer look. Tsavorite porphyroblasts, along with rough and faceted gems from Tsavo area, Kenya. Stones courtesy: Genson Micheni Musa/ Tsavolite Co Ltd, Photo: V. Pardieu/Gübelin Gem Lab, 2007. Tsavorite benefits from the marketing efforts of the diamond trade that have intensively educated the consumer on the important properties which define a gem's beauty such as high dispersion, brilliance and transparency. If one compares tsavorite to emerald in these areas, it is game, set and match to the green garnet. In addition, thanks to its high saturation, tsavorite also pleases those with an aesthetic for fine color. While emerald inhabits a green world all its own, the verdant hue of tsavorite is exceedingly pleasant. With a Mohs value nearly that of emerald, tsavorite is hard enough to allow a fine polish. This, coupled with high clarity and a lack of cleavage, has turned tsavorite into a popular stone among the emerald cutters of Jaipur, India. Here tsavorite is commonly used as an alternative to small emeralds which are too brittle, expensive and difficult to cut in small sizes, making them unsuitable for many modern jewelry requirements such as invisible and pave settings. The main challenge tsavorite faces in trying to escape is its "collector gem" status is rarity. The fact is that tsavorite is simply too rare to interest most jewelers. When it comes to rarity, less is not always more. A young jeweler from Bordeaux was fascinated with tsavorite and happily shared his passion with one of his clients, to the degree that the customer actually decided on the purchase of a tsavorite ring rather than emerald. But this is a story with an unexpected ending. The next year his customer returned, requesting a pair of tsavorite earrings and necklace. Great, right? Not so fast. Months were spent trying to find enough stones that matched the original ring. Eventually the sale was made, but the jeweler rued the day he introduced tsavorite to a customer who wanted emerald. Unlike tsavorite, emerald is easier to find in the market, easier to sell thanks to its fame, and more expensive to boot, thus allowing a higher profit. In other words, more money and fewer headaches. However, tsavorite offers an untreated alternative, and potentially higher profit margins. When it comes to gems, less is not always more. A gem cannot be promoted with success if there is limited availability. Tsavorite obviously has the requisite qualities to make it an extremely popular gemstone; it only lacks adequate and consistent supply. 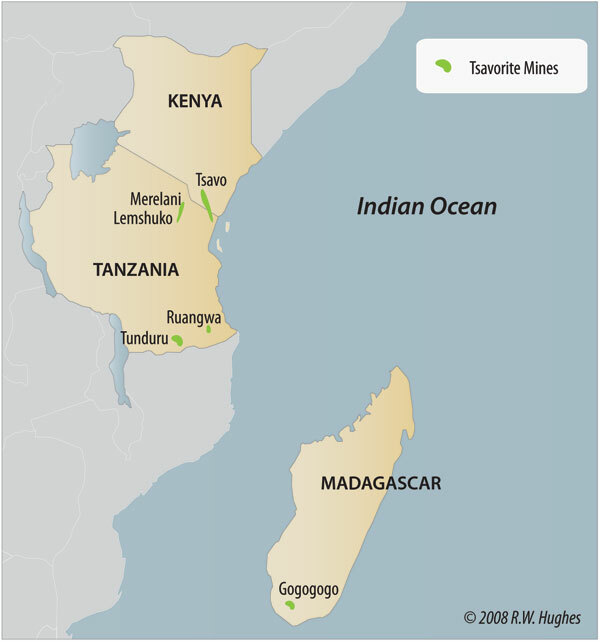 Map showing the tsavorite mines of East Africa. Illustration: Richard Hughes. To understand the tsavorite supply challenge, we will take a brief look at the gem's geology and mining potential. Tsavorite is commercially mined in Tanzania, Kenya and Madagascar, mainly from deposits located along different fault systems. 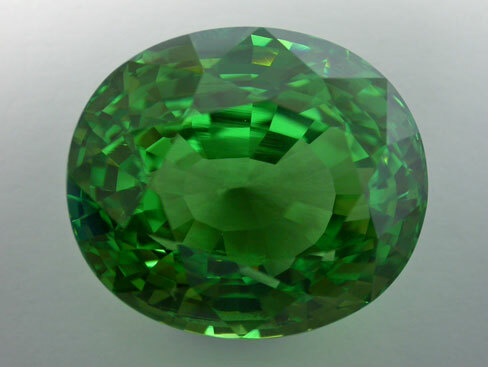 Tsavorite was first found in 1967 along the Lelatema fault system in northern Tanzania, running from Merelani to Lemeshuku (Bridges, 1974, 2007). The area produces attractive tsavorite in all shades of green, from near colorless to dark hues (E. Saul, pers. comm.). Fine large stones over ten carats have been reported from this area, but are truly rare. In the authors' experience, tsavorite from this area are usually slightly lighter and brighter compared with those from the Tsavo region. While a problem in small stones where it results in weak saturation, it can be an advantageous quality in larger stones. The Karo mine, in Merelani Block B is known to produce light stones, but this is balanced by the fact that Karo is possibly the only place where really large, clean gems are found. Coming in small to medium sizes, the Karo material commonly known as mint garnet is usually too light to be called tsavorite, but when large stones are cut, the resulting color increases in saturation (Kane, 1990). The Karo mine has produced exceptional gems as large at 300 carats after cutting (Weinberg, 2007). Most current mining operations in this area are located at Merelani, such as the Karo mine, or around Lemeshuku. The latter was one of the most active tsavorite mining areas that we visited during our expeditions with the Saul brothers operation and was the location chosen for the TsavoriteOne project. The authors visiting the Swala Gem Traders tsavorite mining operation at Lemeshuko, Tanzania. To accommodate mining in this dry area, the Saul brothers built an ingenious sorting machine to separate tsavorite from the waste earth using as little water as possible. Photo: V. Pardieu/Gübelin Gem Lab, 2007. The second mining area is the Tsavo region in Southern Kenya, which gave its name to tsavorite. 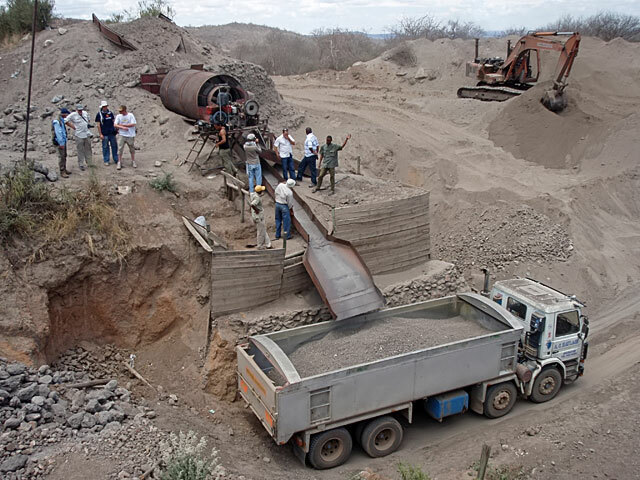 Many small mining operations are located along a fault system extending from the Taita Hills of Kenya to the Umba Valley in northern Tanzania, passing through the Tsavo, Kasigau and Kuraze areas. This is where Campbell Bridges discovered tsavorite in 1971 and where he continues to mine (Bridges, 2007). While traveling in the area in 2005 and 2007, one of the authors (VP) visited more than ten different tsavorite mines, including that operated by Bridges. Most operations are worked by first collecting material on the ground after prospecting, followed by trenching and finally underground tunneling. Many operations are worked by hand and only a few are mechanized. The number of miners in each operation ranged from between 10 to 50, with possibly a total of about 2000 people making a living from tsavorite mining and trading in the Tsavo region (Pardieu, 2007). 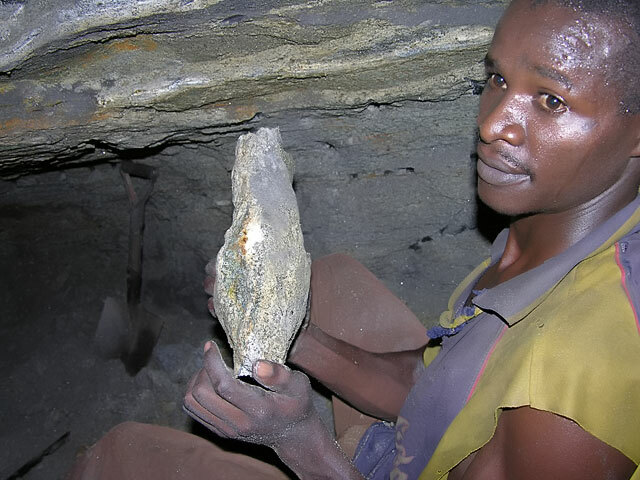 A young Kenyan miner collecting a tsavorite porphyroblast about 20 meters underground in the Tsavo area. Photo: J.B. Senoble, 2005. The third active tsavorite mining area was discovered in 1991 near Gogogogo village (Mercier, 1997) in the southern part of Madagascar. It was worked for a short period by the Delorme company (currently known as SMDA). In 1997 a second deposit was discovered near Behara village about 20 kilometers south of the initial find. The mining area is located about one day's drive to the south of Ilakaka, about 40 km from Ampanihy. Besides tsavorite, the area is also known for its attractive color-change vanadium-rich garnets. Satellite images reveal the two deposit locations along the same fault system. When the author (VP) visited the Behara mining area in August 2008, about 300 local people were found trading gems and working pits, trenches and underground tunnels. We were shown many parcels, which included gem quality rough up to two grams. The material was slightly dark, especially in the larger sizes, and somewhat reminiscent of stones from Tsavo area. 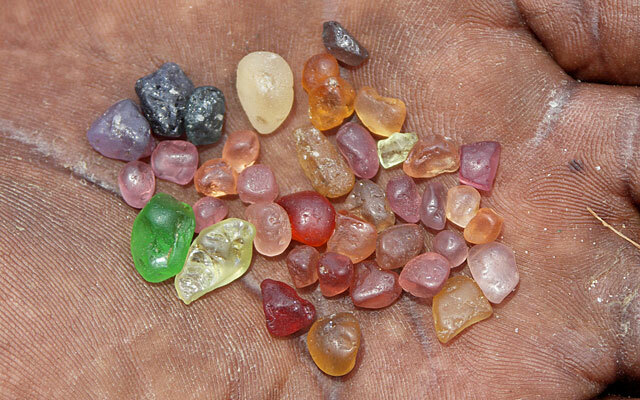 A Tunduru miner presents gems from his mine on the Muhuwesi river: a piece of tsavorite is shown next to garnets, spinels, chrysoberyl and sapphire. Photo: V. Pardieu/Gübelin Gem Lab, 2007. 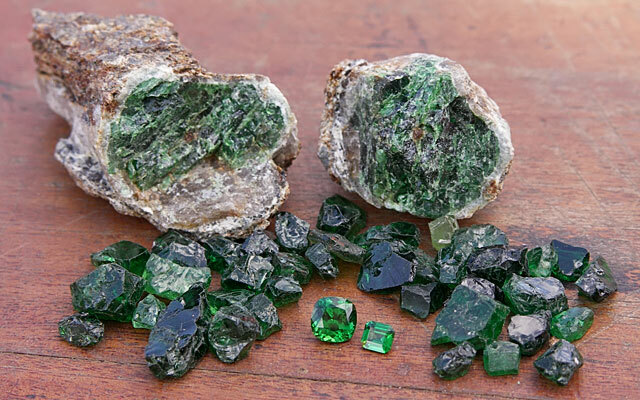 In 1994, tsavorite was found in the rivers of Southern Tanzania's Tunduru District, associated with other garnet varieties, sapphires, rubies, chrysoberyl, diamonds, spinels and many other gems. 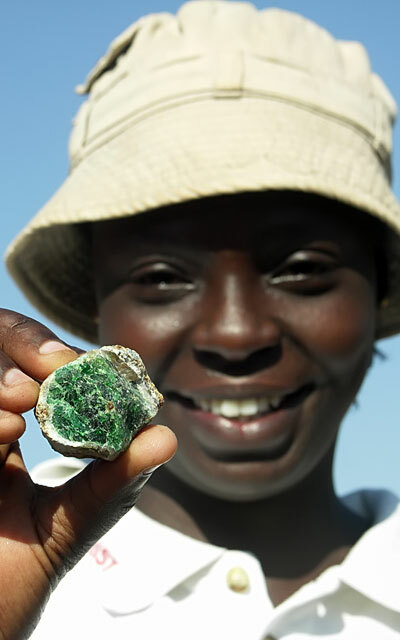 Visiting the Tunduru deposit in 2005 and more extensively in 2007, the authors often found rounded pebbles of bright tsavorite within gem parcels from the Muhuwesi River. As of 2007, around a thousand people were involved in gem mining and trading in Tunduru, down from several tens of thousands during the period from 1995 to 1999. In Tunduru, tsavorite is a by-product of sapphire and chrysoberyl mining; its production is not believed to be significant (Pardieu, 2007). Near Ruangwa, the author (VP) with a group of tsavorite miners 200 meters underground. Photo: Michael Rogers, 2007. In 1999, a large primary deposit was found at Namungu Hill, 18 km northeast of Ruangwa, a small city famous for its cashew nuts, located between Tunduru and the Tanzanian coast. 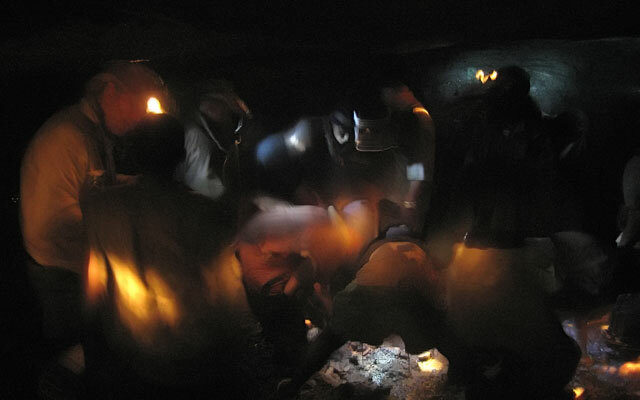 When we visited the mines in October 2007, about 300 miners were digging tunnels in the hill, down from a thousand miners after the initial discovery. The Gemini Exploration and Mining Co. pit we visited was approximately 150 meters deep. There we found about 50 miners working with jackhammers and pumps; the latter is used to control water infiltration which is a constant challenge in Ruangwa. Local miners told us that production includes sizes ranging up to 11 grams of fine rough. We were able to observe several attractive rough stones up to five carats. 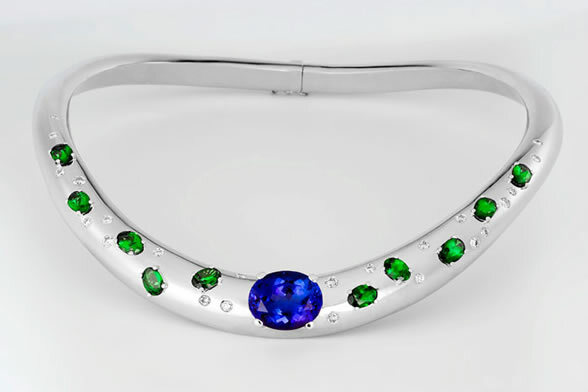 Necklace featuring tanzanite and tsavorite made by Hans Brumann. Photo: courtesy of TanzaniteOne. With five different mining areas spread across three different countries, it would appear that mining prospects for tsavorite would be immune to the vagaries of political, social and climatic upheaval. Nevertheless, gem mining in places like East Africa is always a risky investment. Campbell Bridges was asked in 2005 why he was only working one mine, rather than several others in the area. His answer was telling: "Better small and profitable than big and bankrupt." He went on to explain that with only a limited number of people he could truly trust, expansion would only mean the enrichment of thieves. To operate on a large scale not only requires investment in mine engineering, geological studies and infrastructure; it is also necessary to invest in security. This is something large and well financed operations such as TanzaniteOne are very serious about. The authors discovered this first-hand when they were asked to strip during routine random checks while visiting the mine. If large clean tsavorites are rare, this gem weighting more than 40 carats is truly an exceptional stone. Believed to have been found at the Karo mine in Merelani, Tanzania, the stone's only visible inclusions using the microscope are the growth lines we can see near the center of this incredible gem. Stone courtesy Multicolour.com; Photo: V. Pardieu/AIGS, 2004. With the exception of the new large TsavoriteOne project, most tsavorite mining is performed by small companies working a single deposit with few machines and usually not more than 30 people, including miners, guards and cooks (Pardieu, 2007). In this sense, the arrival of a project like TsavoriteOne could be welcome news for all tsavorite miners who could potentially benefit from the marketing TsavoriteOne will likely invest in. The fact that large companies are getting interested in tsavorite mining and trading seems to be good news for this gem's future. It is difficult to predict whether tsavorite will remain a "collector gem" or graduate to become a mainstream stone like tanzanite. The current interest of a powerful mining group certainly gives hope for the future. But there are important differences between the two gems. Tanzanite is available in much larger sizes and the possibility of matching colors is increased via heat treatment. In the end, tsavorite is perhaps simply too rare to be modern. We may have to content ourselves with the fact that this gem is not unlike the lions that roam Tsavo—a wild beast of majestic glory—one that will remain forever untamed. The relationship between tanzanite and tsavorite is a fascinating one, with a rich literature full of explanations regarding the geological context where the gems are found. Examples are Bridges (1974), Keller, (1993), Pohl and Niedermayr (1978), Sarbas et al. (1984), Key and Hill (1989) and Simonet (2002). Tsavorite is generally found in pockets called locally "eyes," "potatoes" or, in the case of tanzanite, boudins. 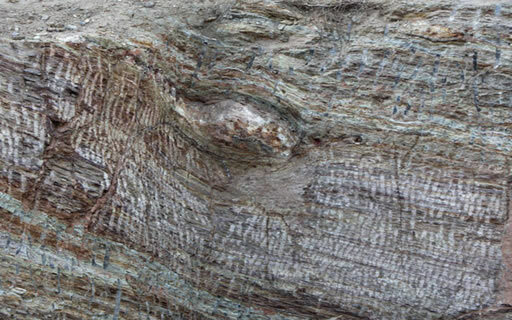 The Kenyan nodules we collected were in fact porphyroblasts with kelyphitic rims (Simonet, 2001; Suwa, 1996; Keller, 1992; Bridges, 1974). A porphyroblast is a large mineral crystal that has grown within the finer grained groundmass during a metamorphic process. Having a kelyphitic rim means that a mineral shell, consisting mainly in this case of scapolite, grossular, diopside, sphene, magnetite, plagioclase, calcite and quartz (Suwa, 1996), was formed by reaction between the mineral and the surrounding rocks. In all the areas we visited we saw, as reported in the literature, that tsavorite pockets were located in graphite-bearing gneiss in contact with marbles (crystalline limestone) that had been subjected to high grade metamorphism. Ruby was also never far away. The relationship between tsavorite and tanzanite is clearly visible in this mixed crystal. Illustration courtesy of TanzaniteOne. Tsavorite and tanzanite are closely related, with tsavorite formed during prograde metamorphism at temperatures around 550 to 650C and pressures around 3 to 5 kilobars. In contrast, tanzanite is usually formed later, while retrograding towards more usual mineral-forming conditions with temperatures around 500C, pressures around 2 kilo bars and the action of some fluids. (J. Saul, pers. comm. ; Keller, 1993). 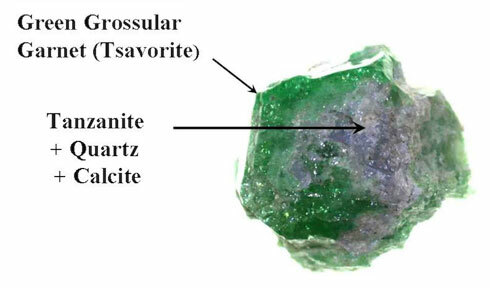 Due to higher metamorphism, the accumulated stress is higher for tsavorite than tanzanite. This explains why tsavorite is usually found in smaller broken pieces, as the crystals break when the stress is released. Large faceted tsavorites are thus far rarer than tanzanite. The chemical compositions of the two gems are related, differing mainly in the presence of OH groups in tanzanite. This is because tanzanite forms from the transformation of tsavorite by fluid action. Indeed, when visiting tsavorite mines at Lemeshuko, Tanzania, we were able to see tsavorite boudins with a tanzanite skin, one gem morphing around the other. At the Karo mine in Merelani's Block B it happened that some tsavorites were protected from hydrothermal fluids and escaped being transformed into tanzanite. Stress was also released slowly. Large exceptional tsavorite crystals can then be found. An indication of the difficulty of tsavorite mining comes in the form of this large "bogus" porphyroblast (approx. 50 centimeters by 30 centimeters) seen in Tsavo area; all eyes or potatoes are not full of tsavorite. Photo: V. Pardieu/Gübelin Gem Lab, 2007. The major difficulty in tsavorite (and tanzanite) mining is to locate places where these pockets are concentrated enough for mining to be profitable. The pockets are mostly associated with faults and folds, meaning that beside the obvious metamorphism process, some metasomatic process could also be necessary for tsavorite to form. Campbell Bridges reports that the best places for tsavorite to be found are the crest of anticlinal folds (Bridges,1974). Miners also reported during our mine visits that good pockets are located in areas where faults are intersecting with the gneiss and marble layers. In fissures and inside anticlinal folds, fluid migration is easier and thus this theory makes sense, but yet it is not fully understood (Simonet, 2001). This close relationship between tanzanite and tsavorite explains the scientific and technical logic behind the interest of TanzaniteOne in tsavorite. Indeed, when we visited Tanzanite One in 2005, Bernard Olivier (who is now associated with the TsavoriteOne project) was our guide. At that time he was working on his PhD about tanzanite. He explained that tanzanite and tsavorite geology were very similar, and that studying tanzanite is also a path to expertise in tsavorite. How true, how very true. 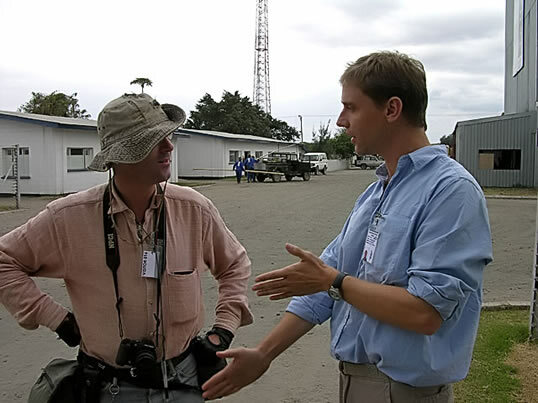 At the TanzaniteOne mining operation at Merelani, Tanzania, Dr. Bernard Olivier talks tsavorite and tanzanite geology with Vincent Pardieu. Photo: J.B. Senoble, 2005. To the following tsavorite enthusiasts who took the authors to discover a wonderful gem while visiting East Africa in 2005 and 2007: Jean Baptiste Senoble of Nomads, Kennedy and Suzie Khamwathi, Campbell Bridges of Tsavorite USA Inc., Jenson Micheni Musa of Tsavolite Ltd, Mark and Eric Saul of Swala Gem Traders, Dr. Bernard Olivier of TanzaniteOne, geologists Gaston Giuliani, Daniel Ohnenstetter and Julien Feneyrol from Nancy University in France for their present and future enthusiastic collaboration on a tsavorite research project. Finally a big thanks to Elise Skalwold for her editing job. Glass or Tsavorite? Visiting Tanzania in 2007, gemologists Richard Hughes and Vince Pardieu wondered if this stone, reported to have been mined in Tunduru, was genuine or just a fake. Photo: V. Pardieu/Gübelin Gem Lab, 2007. The best way to care for tsavorite garnet is to clean it with warm, soapy water. Avoid exposing it to heat or acids. Amstutz, G.C. & Bank, H. (1977): Geologishe, petrographische und mineralogishe Beobachtungen in einigen Minen von Smaragd, Tanzanit, Tsavorit und Rubin in Tansania und Kenya. Zeitschrift der Deutschen Gemmologischen Gesellschaft, 26, pp. 118–127. Amthauer, G. (1975): Zur Kristallchemie und farbe gruner und brauner grossulare aus Tansania. Zeitschrift der Deutschen Gemmologischen Gesellschaft, 24, pp. 61–72. Bank, H. (1975): Grune chrom-und vanadiumhaltige Granate (grossulare) aus Kenya: Tsavolith-Moglichkeit einer neuen Benennung? Zeitschrift der Deutschen Gemmologischen Gesellschaft, 24, pp. 13–15. Bank, H., Schmetzer, K. & Probst, S. (1979) Vanadium Grossulare mit hoher Lichtbrechung (uber 1.750). Zeitschrift der Deutschen Gemmologischen Gesellschaft, 28, pp. 70–72. Bridges, C.R. (1974) Green grossularite garnets (tsavorites) in East Africa. Gems & Gemology, Summer, pp. 290–295. Bridges, C.R. (2007) My road to the discovery of tsavorite. InColor, Summer 2007, pp. 22–24. Gübelin, E.J. and Weibel, M. (1975): Green vanadium grossular garnet from Lualenyi, near Voi, Kenya. Lapidary Journal, Vol. 28, No. 2, May, p. 402. Henn, U. (1999) Green garnet (tsavolite) from Madagaskar. Zeitschrift der Deutschen Gemmologischen Gesellschaft, 48/2, pp. 111–113. Jackson, B. (1992) Vanadian grossular garnet from Pakistan. Journal of Gemmology, 1992, 23, p. 2. Kane, R.E., Kampf, A.R. & Krupp, H. (1990) Well-formed tsavorite gem crystals from Tanzania. Gems & Gemology, Summer, pp. 142–148. Key, R.L. & Hill, P.G. (1989) Further evidence for the control on the growth of vanadian grossular garnets in Kenya. Journal of Gemmology, 1989, 21, p. 7. Keller, P.C. (1992) Gemstones of East Africa. Phoenix. Geoscience Press, 160 pp. Krzemnicki, M.S., Hanni, H., Reusser, E. (2001) Colour change garnets from Madagascar: Comparison of colorimetric with chemical data. Journal of Gemmology, 2001, 27, 7, pp. 395–408. Laurs, B.M. (2004) Large tsavorite and green grossular from Tanzania. Gems & Gemology, Spring 2004, pp. 72–73. Manson, V. & Stockton, C.M. (1982) Gem quality grossular garnets. Gems & Gemology, Winter 1982, pp. 162–173. Mercier, A., Moine, B., Delorme J., & Rakotondrazafy, MAF. (1997) A note on a new occurrence of vanadian grossular garnet from Madagascar. Journal of Gemmology, 25, No. 6, pp. 391–393. McClure, S.F. (1999) A new source for tsavorite. Gems & Gemology, Summer, pp. 151–152. Muije, P. (1979) Colorless and green grossularite from Tanzania. Gems & Gemology, Summer, pp. 162–173. Pardieu, V. (2005) Tsavorite une pierre Africaine. Revue de Gemmologie AFG. Pardieu, V. (2005) An update on ruby and sapphire mining in Southeast Asia and East Africa. Summer, www.fieldgemology.org. Pardieu, V. (2007) Tanzania Oct 2007, A gemological safari. www.fieldgemology.org. Pohl, W. & Neidermayr, G. (1978) Geology of the Mwatate quandrangle (sheet 195/2) and the vanadium grossularite deposits of the area. Kenya-Austria Mineral Exploration Project 1975-1978. Ministry of Natural Resources, Kenya. Pohl, W. & Horkel, A. (1980) Note on the geology and mineral resources of the Mtito Andei-Taita area. Mitt, österr. geol. Ges. Vol. 73, pp. 135–152. Sarbas, B., Georg, V., Amstutz, G.C., Schmetzer, K. & Bank, H. (1984) Zur Genese ostafrikanischer Grossularvorkomen. Zeitschrift der Deutschen Gemmologischen Gesellschaft, 33, pp. 48–62. Schmetzer, K., Berdesinski, W. &. Traub, I. (1975): Vanadiumhaltiger Grossular aus Kenia. Zeitschrift der Deutschen Gemmologischen Gesellschaft, 24, pp. 230–233. Schmetzer, K. & Ottemann, J. (1979): Kristallchemie und farbe vanadium-haltiger Granate. N. Jb. Miner. Abh. 136, pp. 146–168. Simonet, C., Okundi, S. & Masai, P. (2001) General setting of coloured gemstone deposits in the Mozambique Belt of Kenya—preliminary considerations. Proc. 9th Conf. Geol. Soc. Kenya, Nairobi, Nov 2000, pp 123–138. Suwa, K., Suzuki, K., Miyakawa, K. & Agata, T. (1979) Vanadian and vanadium grossular from Mozambique metamorphic rocks, Mgama Ridge, Kenya. 4th Prelim. Rep. Afr. Studies, Nagoya Univ. 1979, pp. 87–96. Switzer, G.S. (1974) Composition of green garnet from Tanzania and Kenya. Gems & Gemology, Summer, pp. 296–297. Wise, R.W. (2006) Secrets of the Gem Trade. Lenox, MA, Brunswick House Press, 275 pp. This article appeared in the ICA's InColor, Fall 2008, pp. 36–45.